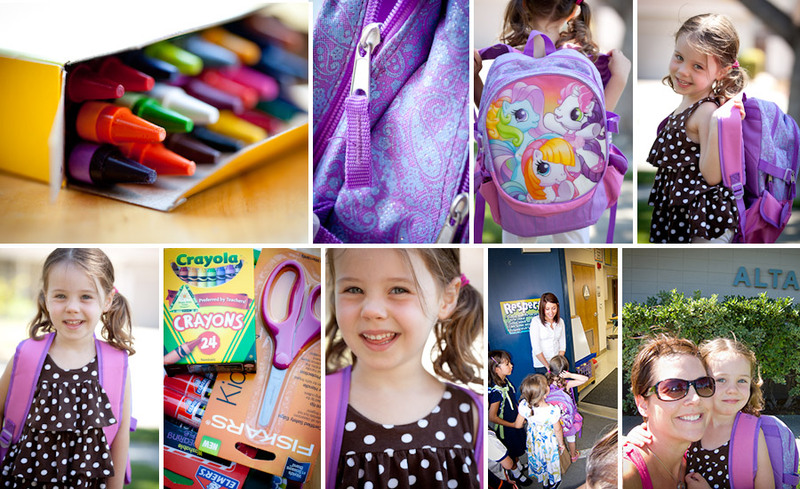 Today was a very special day…our little Kenna started Kindergarten! She woke up early this morning, excited, a little giddy and anxious. I made the first mistake of trying to squeeze in a grocery store run before school. Then I made the second mistake in thinking that walking her to school would be a good idea. Well I planned my time well, except for when we set out to leave. They asked for water. Then for snacks. Then I had to grab the little camera and then run back in for the memory card. It made us a few minutes late, so true to form (I hate being late) I ran about half the way pushing the stroller. I dreaded the thought of her being late. We made it with a few minutes to spare, and I greeted some fellow moms, glistening with sweat. Awesome. But back to Kenna…she had a great day, made some new friends, and played with some familiar faces. All in all a great start to the school year! By the way, Mommy did great too. I was a little emotional, but I didn’t cry. I didn’t want her to cry. But I’m glad this day is over and she’s back at home to make me miserable. I mean happy. She’s also trying out a new smile. She told me today that she didn’t have a smile (must be genetic, haha, I said the same when I was little) and I told her she had a beautiful smile when she’s happy and laughing. This is her laughing smile.